Most of the animus and hatred towards Israel is against the Jewish People as well. The scorn and defamation used against Israel are simply adjusted forms of anti-Semitism modeled to target the Jewish State instead of targeting the Jews themselves. Many of the accusations heard against Israel today can be traced linearly to the anti-Semitisms in both the East and West, in Christian and Muslim worlds which permeated their lexicons throughout centuries since the inception of both religions. Both Islam and Christianity claimed to have replaced the Jews defining the Jews as cast from Hashem and now a tool of Satan. Islam also claimed to have replaced Christianity which should make them just as wary and nervous over Islamic extremism (in reality it is actual essence of Islam and not some stray sect but the mainstream in Islam) and the threats they pose and even proclaim loudly for all to hear. But is Israel necessary or is its existence a causal effect stoking stronger anti-Semitism as a result of Israel’s existence. This will depend on whether people are willing to be objective and honest when addressing the problem just existing has been for the Jew living in much of the world, specifically the Christian West and the Islamic East. The very first item one need get their arms around is that people in the West have been fed a romanticized version of the history within the Islamist world. The Jews know this first-hand as in Israel our population is spread fairly evenly between those who fled, were exiled or otherwise forced from Christian lands and those who fled, were exiled or otherwise forced from Islamic lands. The stories bare a striking commonality, when things went well, the Jew was left to live on the fringes of society and not permitted equality with their hosts and always eyed nervously and when things were less than exemplary, then it was the Jew who bore the brunt of the blame and was the group which was always just a crisis away from persecution, torture, pogrom, being run out of town or simply being executed for being a Jew, the obvious source of all ills. Most of the Jews who came to Israel from Europe after World War II and soon after her declaration of independence arrived with the clothes they were wearing, often tattered and torn to the point of not being recognized as suitable clothing and maybe a small satchel with everything they had left in the world, often worth next to nothing as many carried pictures of their relatives who perished in the death camps. The decade after Israel survived her initial war, where six Arab armies and a slew of militias attacked the nascent state on the first morning of her existence in what was supposed to be a simply slaughtering of the Jews, the Arab World spat out their Jews after stealing everything of any value. Fortunately, nobody informed the Jews about this and Israel, despite losing Gaza to Egypt and Judea and Samaria to Jordan, retained the remainder of what was allotted Israel by international treaties and conventions convened after World War I. The reestablishment of Israel was decided in the aftermath of World War I and thus was a fact in the making before the Holocaust, so Israel was not founded because of the holocaust, the Holocaust was partly due to the British refusing to permit the Jews to declare their independence and working behind the scenes with the Arabs in attempts to delay and eventually renege and not permit Israel to be born. The Jews are a pesky bunch as once they get their mind set on something, they usually attain that goal, and Israel was no exception. During the decade after the birthing pains inflicted by the Arab invasion which cost the lives of nearly ten percent of the population of the state of Israel, the Arab world had their cleansing ritual where over eight-hundred-thousand Jews were expelled by various means from across the Middle East and Northern Africa, mostly the Arab Islamic world plus Iran, and were taken in by Israel. These Jews from the Islamic world had been stripped of all wealth; most of their possessions, family heirlooms, businesses, homes, vehicles, jewelry even down to ornate picture frames and anything that glittered were stolen. They arrived in Israel with their clothes on their backs and if fortunate, a suitcase or two per family. Unlike their Arab refugee brethren, mostly the Arabs consisted of those who heeded the Mufti of Jerusalem when he bade them to take refuge behind the Arab armies and then they could return in a few days and share the wealth of the Jew; the Jews welcomed their brothers and sisters and despite financial hardship, they took them to their bosoms and built Israel together. The Arab refugees waited and after two years of fighting where the Arab armies failed to destroy Israel, the Arabs rounded up their faithful who had done as the Mufti demanded, and they placed them in refugee camps where they and their offspring have languished to be used as a weapon against Israel and the Jew. This is why truth be told, Israel Never Placed a Single Arab in a Refugee Camp. That is true despite all the lies you may have heard about what the terrible Israelis did forcing all these Arab refugees into camps for generations; it was, is and apparently will continue to be an all Arab project loaded with their spin of propaganda which they employ in their attempt to destroy Israel. The Arab League, after the Six Day War, met that September and adopted the Khartoum Resolution with what is known as the “Three No’s”, “No peace with Israel, No recognition of Israel, and No negotiations with Israel;” which can be translated into a single no, no Israel. This has been their starting and ending point for all attempts at finding a solution, including the results even if not obviously the exact words of the Khartoum Resolution, they kept the spirit. So, exactly what do the Arabs and Islamic world desire? That is an easy one to answer, they will accept any peace where Israel is placed under Arab rule, the Jews are to be treated with the same respect as they were in Medina, and then there will be a second Holocaust, as close to seven-million Israelis who are Jewish will be murdered and the over one-hundred-thousand Christian Israelis will be made to be Dhimmi if they are fortunate and murdered with the Jews as there will be an attempt to make the prediction from 1948 so succinctly by Azzam Pasha, Secretary-General of the Arab League at that time who stated, “It will be a war of annihilation. It will be a momentous massacre in history that will be talked about like the massacres of the Mongols or the Crusades.” But the main reason that there exists a necessity for the state of Israel does not have to do with her current population, they are safe for as long as the IDF remains strong and motivated. What it does have to do with are the Jews still living in the Diaspora as they will sooner or later face times of oppression and active attempts at extermination and their only refuge will be Israel. Today, Israel is approaching the point where half the World’s Jews reside in our homelands. These are the homelands of ours after many painful compromises, surrenders as without a nation and an army, how does one contend with the British Empire whose soldiers populate the entirety of your lands and refuse to leave. This is where the tale actually begins. 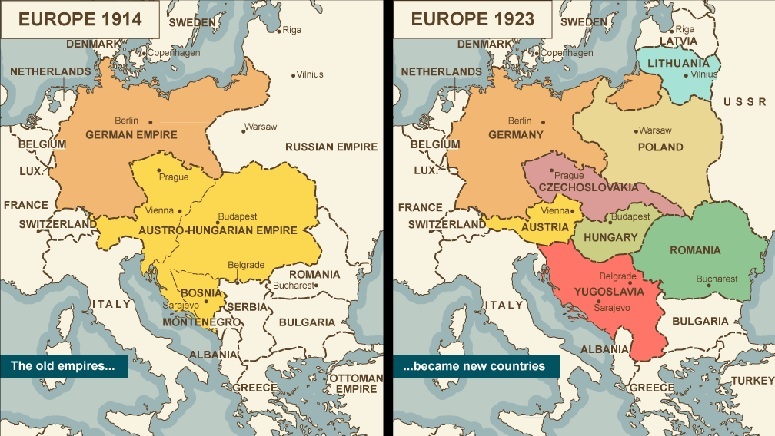 After World War I and the defeat of the Austrian-Hungarian Empire, Greater Germany and the Ottoman Empire by the Allied powers, the lands of the losing side were cut into numerous nations with each of the allies given lands from the Ottoman Empire to oversee reconstituting some form of governance. (For a map of the resultant division in Eastern and Central Europe and the Balkans click here) Below is a map of what was the British Mandate for the establishing of a homeland for the Jewish People. The British made a clerical decision that their mandate to use these lands for a homeland for the Jews meant that some of the land would be used for such and the British could do as they pleased with the remainder. Their initial desire was to keep their promise to the Hashemites and provide a kingdom for both of Hussein ibn Ali al-Hashimi’s sons. Thus, Faisal and Abdullah were crowned with Faisal becoming the king of Iraq and no lands for Abdullah. But the British had a solution and they approached the Zionist Congress, a group of Jews armed largely with pens with which to write to newspapers and officials, but nary a useable gun between them, and proposed that the British Mandate become two lands, one Arab and one for the Jews. The British suggested the Jordan River would make for the perfect boundary with the 78% to the east of the River becoming Jordan under Abdullah, and the remaining 22% would be for the Jews, they promised, solemnly, which means they did not mean to leave well enough alone. The Zionist Congress agreed as what else could they have done. So, any Jews who were residing, farming, tending herds or anything east of the Jordan River found themselves forced to abandon their stake and hastily make for the western side of the Jordan where they would be safer. 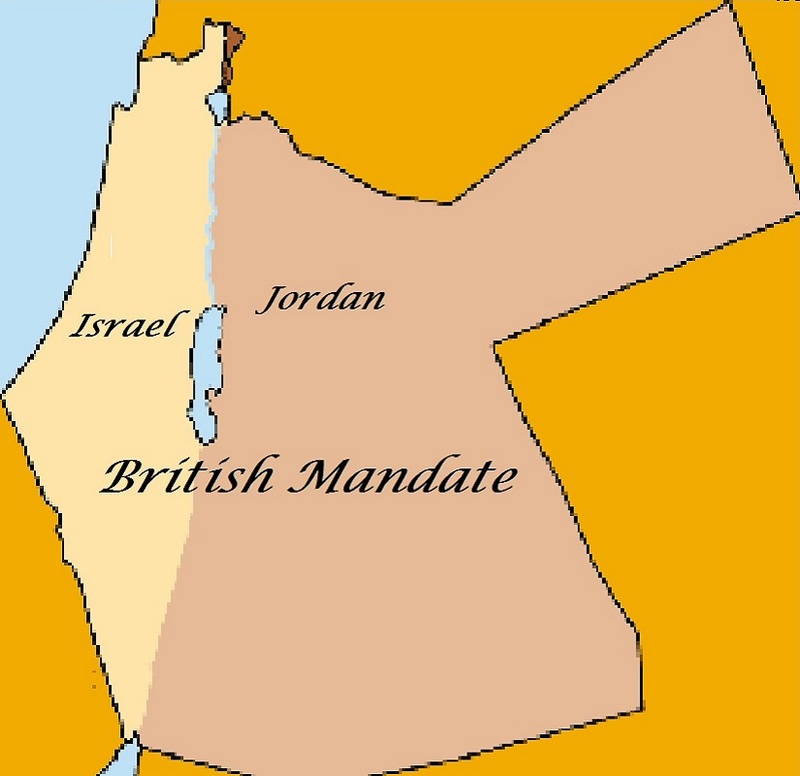 When the United Nations, which under Article 80 of the Charter is supposed to enforce the Mandate system as received from the League of Nations, broke their support for the original British plan and decided that there needed to be two states for two peoples west of the Jordan River. This is the original two state solution. Once again, those responsible for making decisions for the Jews accepted the United Nations compromise, as they did not see any alternative at that point. The Arab League rejected this proposed solution as they had already planned to take care of these upstart Jews as soon as they claimed to be a nation. As this was a General Assembly Resolution, as soon as one side refused it, the resolution is considered dead and buried, well, except this one. The Arabs have claimed that they would accept this solution now but it is no longer considered viable. Truth is, Israel is residing on 22% of the lands initially set aside for the Jewish State and this is too much for the world, they want Israel to be smaller. How much smaller? Well, how small can you make it; can you make it so small that it disappears? That the world would accept with great fanfare and celebratory parties around the globe. But Israel has managed to not only survive, but to thrive, and this rankles a great number of people. But despite all of her successes, Israel has not yet fulfilled her true purpose, a purpose which despite our hopes that this never becomes the case, we see the world and know the true test for Israel will soon be upon us. Israel is the safety catch for Jews which we have had to survive without for approximately two-thousand years. During the Holocaust and all the horrors which were World War II, for Jews there was a specific horror as it opened wide the world body and revealed a darkened heart which had no mercy, concern, care nor compassion for the Jew. This was the Voyage of the Damned, the ship was the luxury cruise liner M.S. St. Louis which left Germany with over nine-hundred Jews fleeing the Nazis who had papers and all the right permissions to disembark at Cuba. Bending to pressures from within and without, the Cuban government reneged on their permissions cancelling their papers refusing to allow them to disembark. The M.S. St. Lois made her way back to Europe with every nation she passed along the way refusing to take any of the Jews except for a small number, some who had British citizenship and some who found any means of not returning to Germany. Most of the passengers who were returned to mainland Europe did not survive the war with many finding death at the hands of the Nazi death machines at Auschwitz and Treblinka. These Jews had no Israel, and this is why the world required an Israel. Looking around Europe and the rest of the world and witnessing the ever-climbing occurrences of Jew hatred in all the forms of anti-Semitism, and the need for an Israel becomes excessively evident. Jews have been denied marching in LGBTQIA events, the Women’s Day March and numerous other events which are part and parcel of the intersectionality definition of those causes which are acceptable and those which require the exclusion of all who support it or are suspected of supporting those unincluded causes. Israel is at the very top of the list with a whole set of sub-causes attached. One of the disqualifying traits is being too obviously Jewish and thus appearing to support Israel. The sole means of breaking from such labeling is to openly and with great ardor supporting the Arab cause and denouncing Israel louder and longer than anyone else, then, just then, maybe you will be permitted to join the intersectionality club. When the people of the far left and their endeared ones such as Ms. Omar, Ms. Tlaib, Ms. Sarsour, Ms. Perez and Ms. Mallory take the helm of the progressive causes in a decade or so, the relationship between Israel and the United States will be on thin ice. Each election will decide whether Israel is favored or targeted. From that point, it is but a slip on a banana peel to the complete rejection of Israel and the rejection of the Jews within the nation. When the United States reaches the point where her Jews are endangered, the signs should be noticeable, as this will follow after Europe has tread that same path a short while earlier. This is why the world needs Israel, if all the discoveries, cures, life improving technologies, agricultural miracles and all the other contributions which come from Israel were not sufficient, which apparently they are not. Israel has been a repository from more than Jews needing a safe place to which to flee. Israel, from 1977 to 1979, permitted approximately three-hundred-sixty Vietnamese boat people fleeing the 1975 Communist takeover of Vietnam to take up residence in Israel offering them citizenship if they so desired. Some of these refugees went so far as to convert to Judaism and their families still reside in Israel. Israel has treated thousands of Syrians who have fallen victim to the horrific civil war raging in that nation. Israel provides medical care for thousands of Palestinian Arabs each year despite the constant threat of terrorism coming from the Palestinian controlled areas. Additionally, Israel is often the first to have a fully operational field hospital set up wherever in the world a natural disaster or other calamity has taken place. These are just a small sample of the reasons that Israel should be viewed as a treasure and not shunned as a pariah as is proven all too often when votes are counted at the United Nations General Assembly and other activities by numerous United Nations agencies. Still, the number one reason the world needs Israel is simply as the place where they can send their Jews when they decide that they are no longer desired. That is a sad commentary on the world, but it is an unfortunate truth.